A very well laid out store indeed, ONE can give any international brand a run for their money. 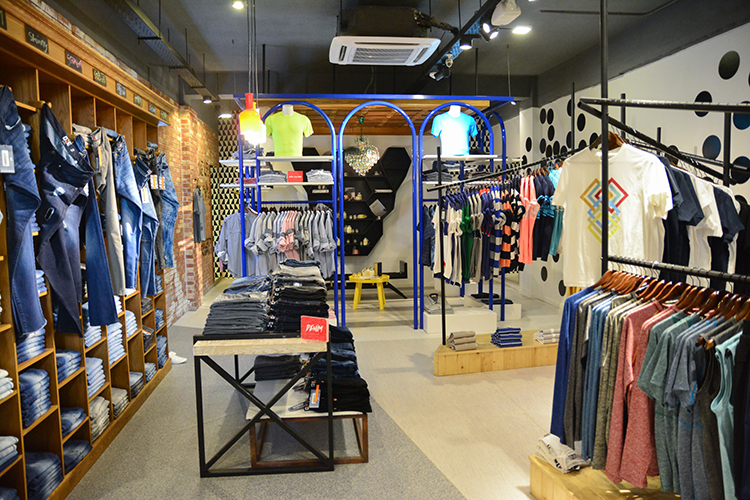 Located on MM Alam Road (they also have a store in Emporium Mall) the place is hard to miss. 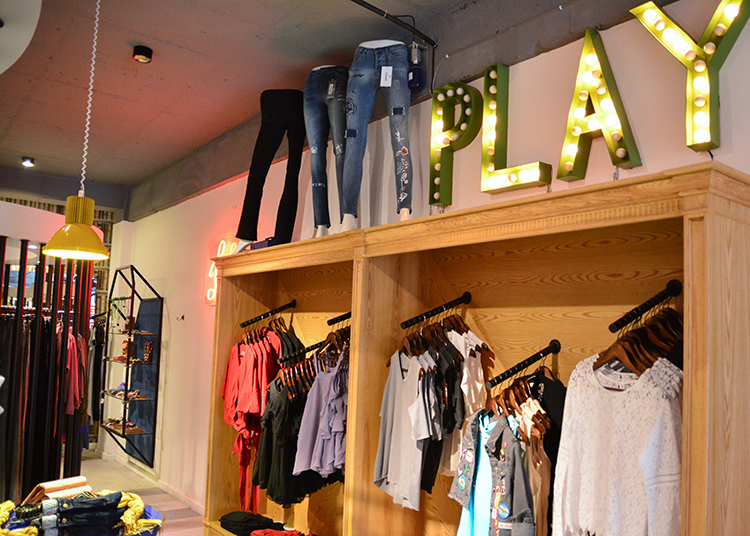 The first floor houses the ladies section, laden with trendy tops, very fashionable lowers and loads of accessories. I tried on some of my favorite looks which were a mix of trendy t’s, painted jeans, very swanky peplum style trousers and a patched cropped denim jacket. I even borrowed a black t-shirt with silver details, and a formal shirt from the men’s section to pair it with my own boy friend jeans for a bit of androgyny. You will see a lot of statement sleeves, peekaboo shoulders, stripes, flares tastefully incorporated in the clothes, showing that brand has a fashion forward approach, and I especially found the fabric to be very comfortable. 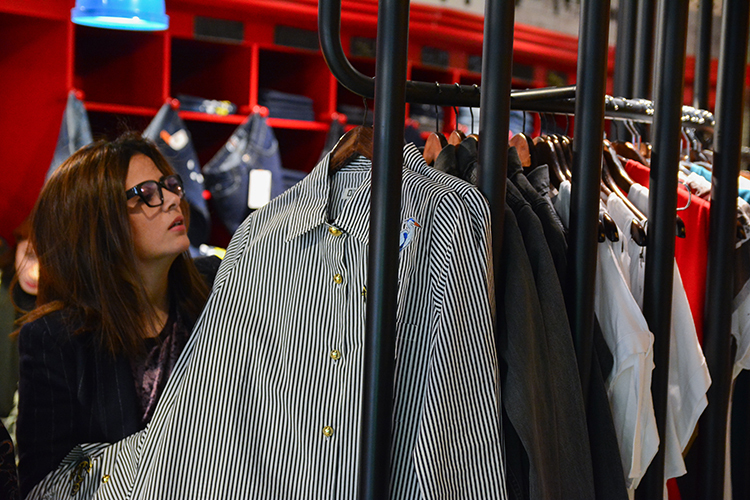 The boys section is quite well stocked too with graphic T’s, denim shirts, quite a range of formal shirts. And then there is the option of customizing your T-shirts which is always a great gift idea. However, what impressed me the most was the active wear section. Not a lot of local brands focus on that but these guys have some great stuff that you can throw on for gym or even if you are the person who likes going about chores in your active wear. To make things interesting you can pair up your look with all the retro and experimental accessories at the store, ranging from bangles, cuffs, necklaces, earrings, belts, you name it. The dragon bangles are fun and quite affordable. I walked away with a striped shirt and peplum style bottoms. Just could not resist buying them and paid around Rs. 4000 for both. On an average the price ranges from Rs. 1200 to Rs. 3000 per piece, so for a trendy look you don’t have to give an arm and a leg (and its much less than a lawn suit). Overall, I’d say it is a good go to store for quick wardrobe needs.